You want to optimize your management IASP / bounces when emailing your mailings or newsletters? This module is for you! 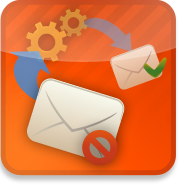 This new module allows you to effectively manage your database users to identify emails that are not valid by treating IASP / bounces that are sent automatically by email servers. With the module, mailings of newsletters and other items will not be automatically made ? ?to address these invalid emails. You keep these addresses in your database, but a field "bounce" in the database stores the error number sent by the final email server. These errors are of 5.X accordance with the specifications of the RFC1893 standard. This module is important because the rate of bad emails in your mailing is a key factor identification spam: well in treating your bounces, you have less chance of having your emails automatically classified as spam by your email boxes customers. On the other hand, some hosts limit the rate to 5% of bad emails allowed when sending and can block if you send emails. When a user with bad email connects to their account on your website, mention it indicates that there is a problem with his email and invited to update their account, which resets management made ? ?by the shop his email. This module requires cron module that allows scripts to run automatically every minute. The field used in the database exists by default in versions PEEL SHOPPING 6.4 and upper. Adjustments are required on older versions.